Improved Dropdown is a jQuery plug-in enables web page authors to create a richer user experience than is offered by the standard browser implementation of the SELECT element. The plug-in supercharges the dropdown controls into combo-box style controls that allow filtering the selection list based on keyboard input. The following two screen shots tell the story of this plug-in better than a 100 words ever could. Okay. I am fully aware that there exist a number of freely available jQuery plug-ins with similar functionality. However, none of them seemed to fit exactly what I needed on one of my development projects so I built ImprovedDropDown originally for my own use, and later decided it was worth sharing with the developer community. 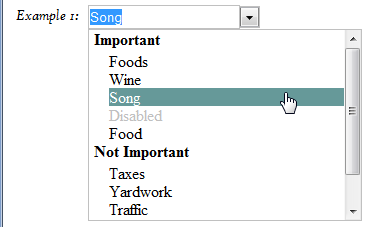 Item #3 may look like a step back since AJAX is a cool way to serve up suggestions for a long list of choices. However, I was looking for a super simple way to add functionality to a dropdown without adding the additional complexity of extra server-side code. Check out the demo to see how it works. The project and all the files you need to get started are available on the Improved Dropdown project page at BitBucket (Go Mercurial!) in case you’d like to contribute, follow the project, or just laugh at all the bug-fix changesets that it took to get to the 1.x version. It’s not working with dynamic data. Let’s say, If i select a country. City listbox will load all cities dynamically using jquery and your plugin not working with City listbox. Can you help please??? That’s really not enough information to help you. Could you post an example on Fiddle (http://jsfiddle.net/) and I’ll try to help.